Welcome to Sohamsa Ocean Estate – two glorious villas perched on the cliff-top on the edge of the Bukit peninsula in the southernmost part of Bali. Here, our guests enjoy one of the most magnificent vistas on the entire island – a view enjoyed from practically every room in both the five-bedroom Villa Soham and four-bedroom Villa Hamsa. Award-winning Singapore architect Ernesto Bedmar created the stunning contemporary buildings, using Indonesia’s abundant natural materials in soaring recycled ironwood pillars, Merbau-wood pavilion roofs, and walls of riverstone and Palimanan stone. Within the elegant interiors, brightened with an au courant palette of cool grey and white, are inspired design flourishes: signature walls of Bengkirai-wood blocks that bring sparks of light into both living pavilions; headboard panelling made of lacquered rice sacks in all the bedrooms; and over-sized resin-candle pendant lights suspended above Italian Statuario marble-topped dining tables. The soul of these stunning cliff-top villas is the professionally trained staff team led by the highly experienced villa manager Pak Adhi – together dedicated to treating each guest as celebrity-special. At their heart is the accomplished chef, whose spectacular dishes mirror the inventiveness and elan of the setting in which they’re served. Whether the villas are booked separately, or together for as many as 18, Sohamsa Ocean Estate offers the level of facilities and service that entice families and friends to stay put and enjoy every aspect. But with a chauffeured car at the ready, guests can be whisked away to the white-sand Pandawa Beach in minutes, and Bali’s best loved surf breaks, sea temples and seafood restaurants are within a half hour’s drive. The owners chose a Sanskrit phrase for the estate name; ‘Soham’ – and its inversion ‘ham-sa’ (translating as ‘I am he’) references oneness with the universe and the presence of divinity in each soul. It’s an apt name as this beautiful setting is sure to inspire awe and contemplation on the beauty and richness of life. Kuta Selatan, the Bukit peninsula, Bali, Indonesia. 2 private, self-contained adjoining villas: 5-bedroom Villa Soham and 4-bedroom Villa Hamsa. Standard capacity ranges from 8 to 18 guests. Up to 22 guests can be accommodated using extra beds (subject to availability; additional charges apply). Both villas have indoor and outdoor sitting and dining areas, equipped kitchens, gym and massage room. The larger villa also has a media room, poolside pavilion, and both steam room and sauna. Each villa has its own swimming pool and sun terrace. Both villas share a team of ten staff, including a villa manager; villa attendants; chef; gardener; engineer; security. Additional staff (eg babysitters, massage and beauty therapists) are available at additional charge. A variety of Balinese, Indonesian, Asian, Western, vegetarian and kids’ dishes prepared from a suggestion menu; barbecue menu; off-menu requests accommodated (including special diets). Grocery cost is charged 20% handling fee which is subject to service and tax at the prevailing rate. 48-inch flat-screen TV with cable channels and DVD player in living room or media room; 42-inch TV and DVD players in the bedrooms; Sonos sound systems; DVD library. Sohamsa Ocean Estate is well equipped for families with young children. Facilities include high chair; cot; pool toys; Playstation. Other equipment can be hired on request (extra charges apply). Both villas have a gym with Treadmill, cycle, cross-trainer, weights bench; in villa treatments selected from a comprehensive spa menu can be carried out by professional beauty therapists in the designated massage rooms (extra cost applies); Soham also has a steam room and sauna. A seven-seater car and driver is available for up to 8 hours a day at a special rate of US$35++ (petrol excluded). When rented together, Villa Soham and Villa Hamsa can host weddings and events for up to 40 seated guests or 60 guests standing. Villa Soham: 1,915sqm (land); 1,309sqm (villa). 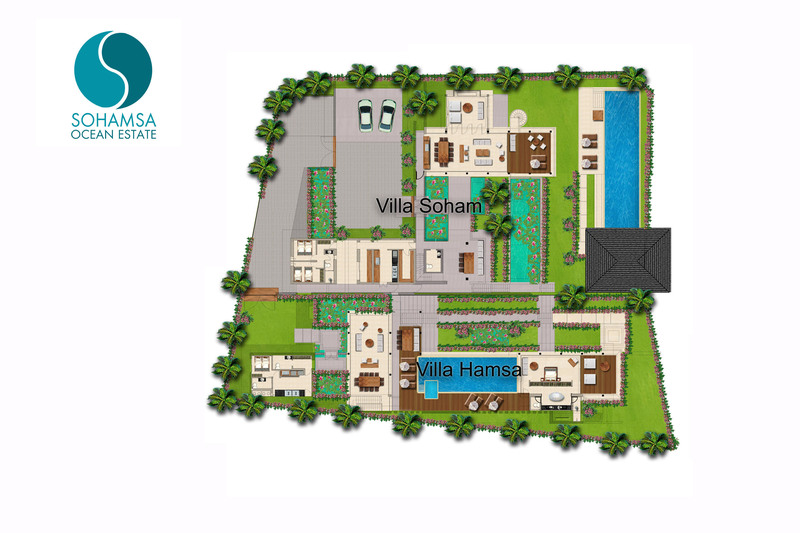 Villa Hamsa: 1,064sqm (land); 883sqm (villa).